Suitable for any devices (smartphone, earphone, speaker, etc) of any version of BT on the market, including: bt 1.0 / 1.1 / 1.2 / 2.0 / 2.1 / 3.0 / 3.1 / 3.2 / 4.0 / 4.1 / 4.2 / 5.0, etc. World&apos;s first APTX HD in both TX / RX mode: powered by premium CSR8675 chipset, CRDC BT adapter supports the latest BT V5.0 and V4.2. Real time audio transmission: CRDC BT transceiver adopt the APTX Low latency technology in both TX and RX modes, which can reduce audio lag under 40ms and let you enjoy fine quality audio in sync with the picture. 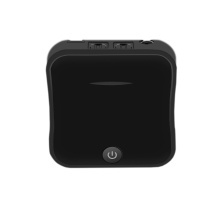 Long battery life: internal battery provides BT adapter for more than 24h of use after 3 hours charging time. It also supports charging and streaming simultaneously. OPTICAL+RCA+3.5MM: apart from 3.5mm Aux / RCA connection, CRDC BT adapter also supports optical cable input / output. With provided optical cable, you can enjoy fine quality digital sound through multiple audio outputs, such as wired stereo, speakers, or headphones. Under TX mode, two BT headphones can be paired at once so parents can watch in silence and give children a needed break, Under RX mode, two smart devices can be paired for playing different songs. Record 8 devices and automatically re-pairing with existing paired devices.